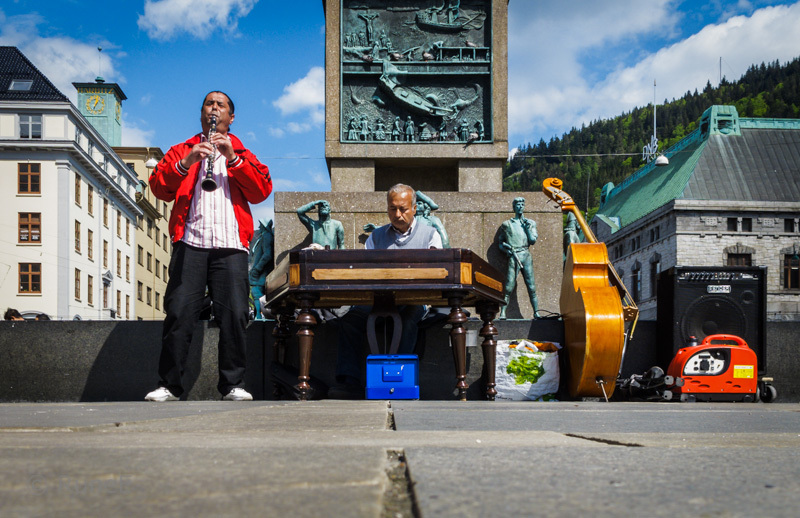 These two guys from Southern America played the streets of Bergen a couple of weeks ago. They told me they were very sorry that their bass was not working properly, so the music was not as fine as it should be. However, it was more than good enough for me! 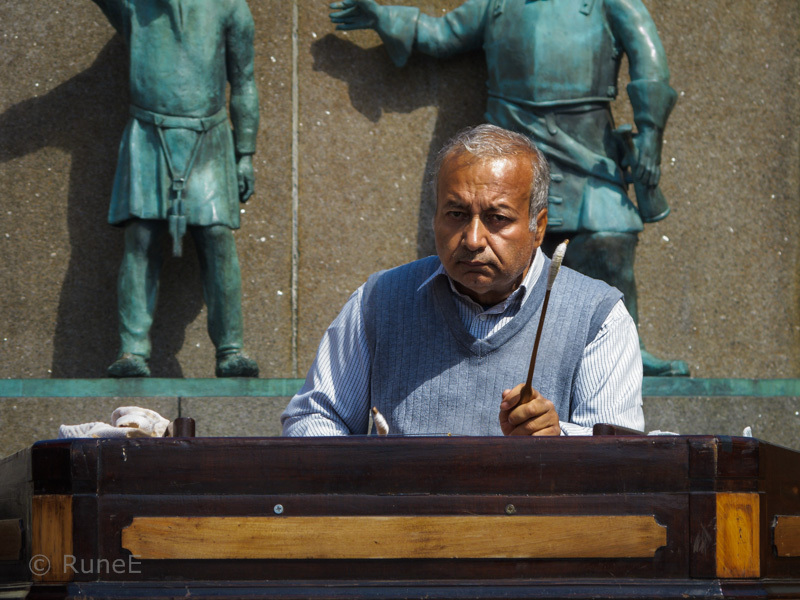 The guy on vibes made me think of Lionel Hampton (whom I've heard in concert). 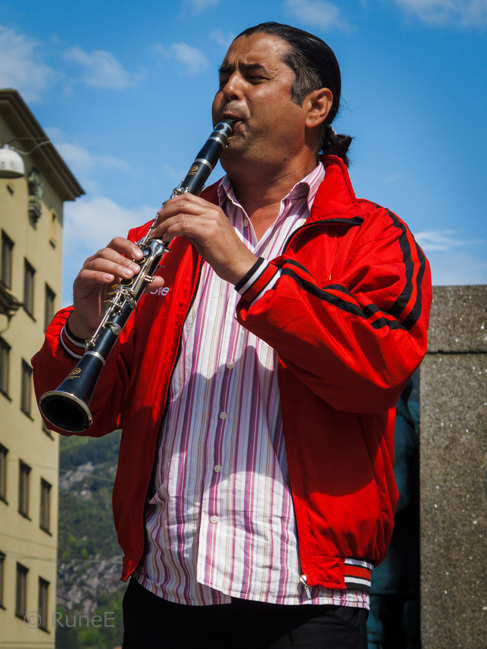 And Benny Goodman was not the only one who could play the clarinet! And good weather to go with it. Some of these street entertainers are better than we get on stage my friend, I always love a swing band-group. Tøft! Det er morsomt å høre på gode gatemusikanter! Oh, I do love street music, especially Caribbean or South American music. Lovely! Vibes make the coolest sound, they are so appropriate for Jazz. Nice candid's. Great music and sunshine both!!! Doesn't get any better!! Wonderful, colorful captures for the day, Rune! Enjoy your weekend! Of course they're gonna hear all that's missing without the bass player, but like you, I'm sure I'd never notice if they hadn't made a point of it. Glad it was good. Vibes (percussion) I posted a marimba, a kind of vibes too? God musikk, fint vær ... kan vel ikke forlange noe mer? live music on the streets. who needs a festival :)? Sounds like it was a treat to hear the music. And it's a treat to see these photos. Nice sunshine! And with your main actors it does not look at all how I imagine Norway. I love this photo with the clock and the mountain in the back. What is the story of the relief directly behind the piano player? Very intriguing with the ships and all..
Herlig godværsbilder av Bergen sentrum. Får meg til å lengte hjem (nå da jeg er på reise annetsteds i verden.